At least 62 people have been killed after militants believed to be from the Somali Islamist group al-Shabab stormed the Westgate shopping centre in the Kenyan capital Nairobi. 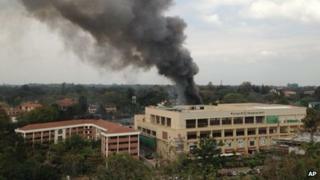 Kenyan journalist Joseph Warungu asks whether more could have been done to prevent the attack. Kenyans have a long list of questions but the first is: how could this have happened? How could a group of heavily armed men walk freely in a city with a stringent security routine? Frequent attacks on people in churches, bars and bus stops that have left many Kenyans dead or wounded in the last few years have forced security checks to be beefed up in most public places. It is normal for everyone, including children, entering buildings to be frisked. Churches are no exception. The Westgate shopping mall has a round-the-clock security operation with guards thoroughly inspecting each and every car that enters the premises. The guards don't even allow anyone to sit and wait in their parked vehicles. So how is it possible for terrorists to breach all this security and reach one of the most prestigious shopping centres in Kenya? The answer is that 15 people with AK-47s and grenades are difficult to stop. Which leads to yet another question: Why, then, do we bother with the daily checks in public places? How did the attackers get hold of the weapons and ammunition they were carrying? How did all this planning and execution escape the ear and eye of the police and security services? These are difficult questions but there are some simple clues. Kenya, which shares a long border with Somalia, has very porous borders and the flow of small and light weapons has become a big headache. Corruption, too, is rife. With the right kind of money, it is quite easy for foreigners to enter the country without proper papers or scrutiny. This fact was demonstrated recently when a Nigerian who had been deported on charges of carrying out dubious activities slipped back into the country with forged travel documents, much to the embarrassment of the authorities. Similarly, with the right kind of cash in the right sort of hands, it is easy to buy Kenyan residency and citizenship. That different security agencies of the state came together to tackle the Westgate crisis was hugely commendable. The regular Kenya police, the paramilitary General Service Unit, the Kenya Defence Forces and the National Intelligence Service quickly joined hands to rescue hostages and tackle the attackers. But security experts question whether these agencies properly co-ordinate their activities and share intelligence before such incidents happen. When the police first arrived at the scene, there were reports of confusion over who should do what and how. A similar confusion was reported during the initial response to the recent fire at Jomo Kenyatta airport which highlighted the need for better co-ordination. 1) With the lessons learnt from the 1998 US embassy bombings and Westgate, how can we prevent such a terrible incident from happening again? 2) How can we review and restructure our security organs and co-ordinate them better so that they can be more effective in future? 3) With Kenyans' historical mistrust of the police, how can we rebuild their trust so that they easily and freely share valuable intelligence with the police? 4) How can we ensure that corruption does not become the terrorist's best weapon of mass destruction? With President Uhuru Kenyatta himself losing a relative in the Westgate attack and pledging to stand firm against terrorism, Kenyans are hopeful that their government will focus its undivided attention on these pressing security concerns.